This February 2017 Stitch Fix box did not disappoint! 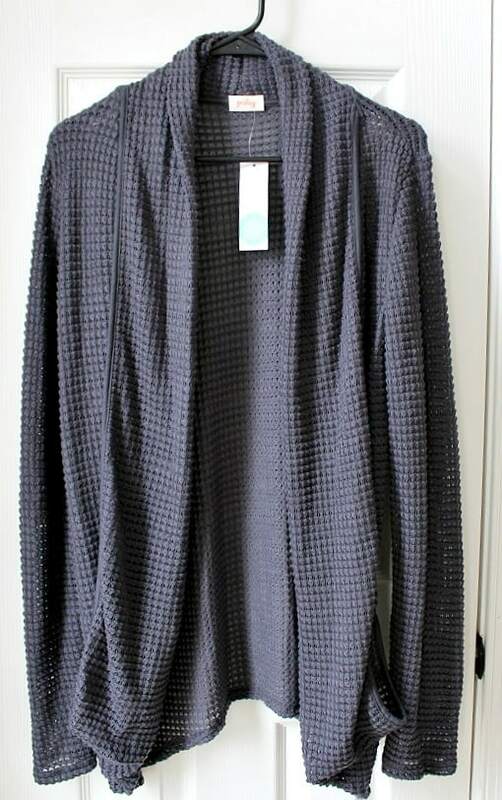 After a couple total misses, I gave up on the Stitch Fix styling service quite awhile ago. I kept seeing really great reviews more recently and decided to give them another try. I’m glad I did because my February 2017 Stitch Fix box was nearly perfect! This month’s box was actually my sixth fix with Stitch Fix. I made sure that the Pinterest style board I submitted for review only had items I really love on it. I think that made all the difference because my stylist, Liz, referenced it a few times in the note she sent with my fix explaining the items she chose for me. Because I am in the midst of trying to lose weight from a sudden health-related weight gain, I had my sizes a bit wrong. I love every single item Liz chose, but unfortunately most were too big. My advice to you would be to be sure to give as accurate description of your sizing needs as possible. I will definitely be updating mine for my next fix! 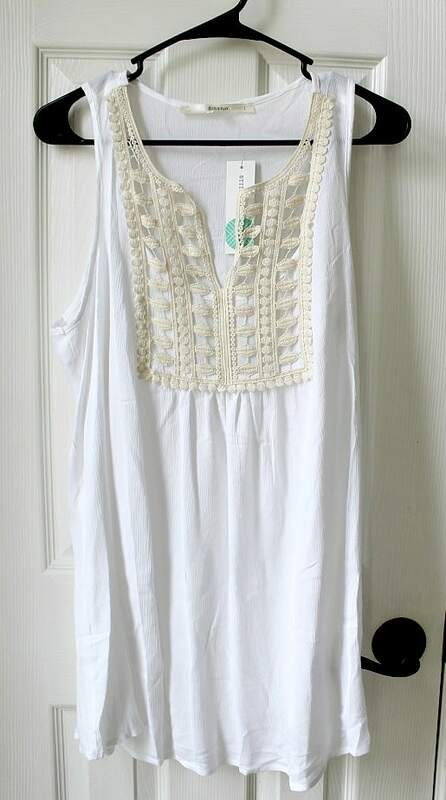 I love the cut of this shirt, the lace details, and the loose fit. 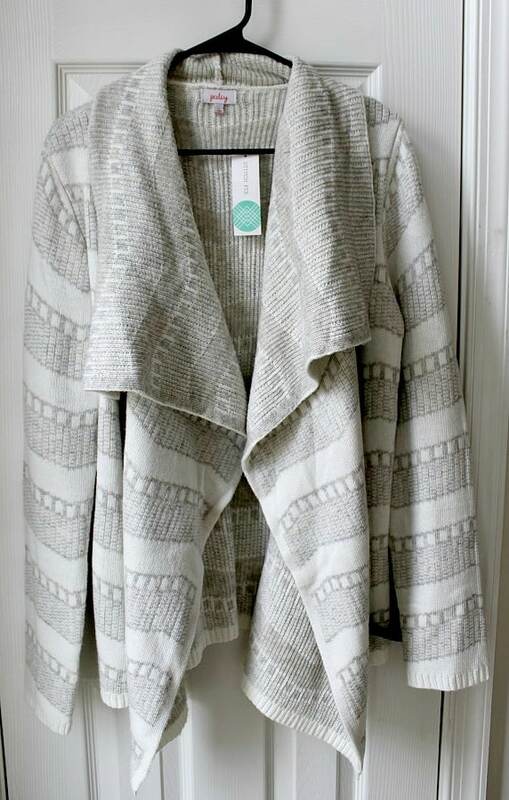 It’s perfect for layering under cardigans. It is just a tad too big on me and it’s also a bit sheer for me. Liz choose this based off of a similar item I have on my Pinterest style board! 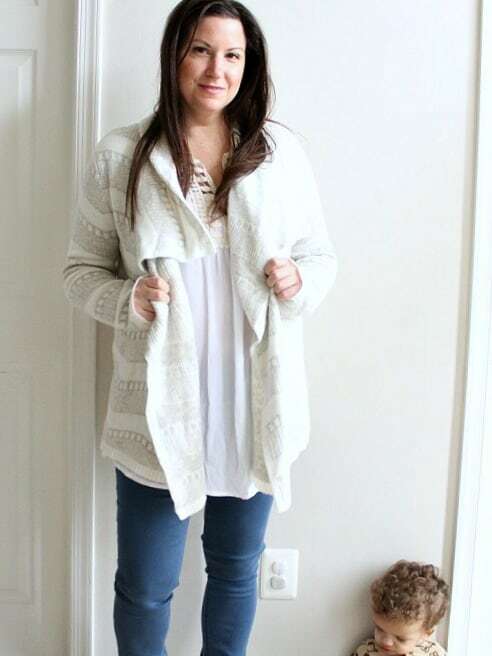 I love the style of this cardigan, the color, and how soft it is! It’s a heavier cardigan so the fact that it’s too big is really obvious. I opted not to exchange this for a smaller size only because I won’t get much use out of it before the season changes. If we were heading into Fall, I would have asked for the next size down for sure! I fell in love with this the second I put it on. It’s so soft, lightweight, and just super comfortable! The sizing isn’t an issue because it’s so light and slouchy anyway. I had to keep this one! Liz chose to send me Level 99 jeans because I have bought a couple other pairs from Stitch Fix before. They are seriously the most comfortable jeans ever. I wear my other two pairs all the time! I love that she chose colored jeans for me. I have been wanting to include more color in my wardrobe! The only reason I didn’t keep these was the sizing. I think I need to go at least one size down. I love that Stitch Fix is now sending shoes! 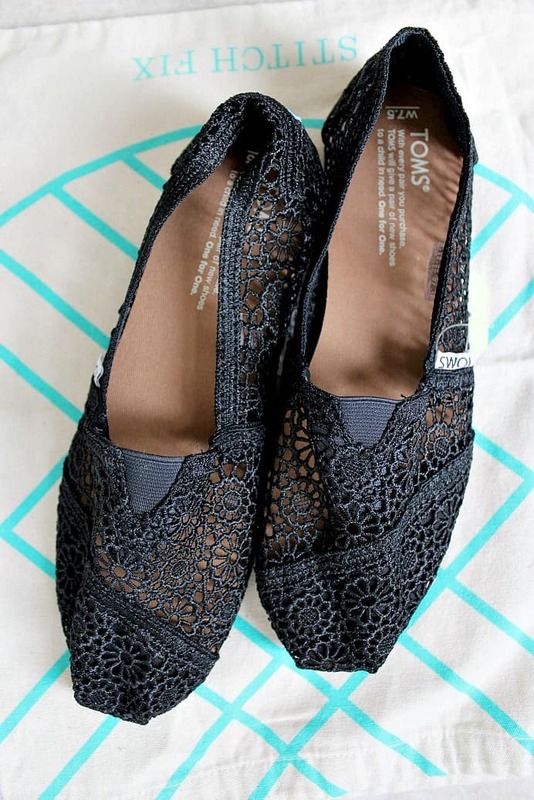 And I love Toms! I wanted to keep these, but when I was looking through my Spring and Summer clothing I couldn’t justify it. I just don’t have enough clothing that would go well with black shoes. Maybe if they were cream, or tan, or even pink! Still, it was hard to package these up to send back. 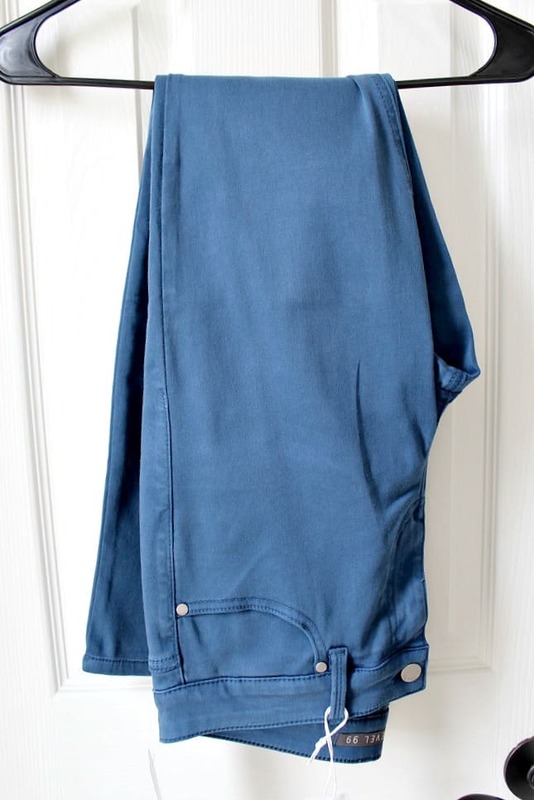 Stitch Fix is super easy to use. You fill out a survey about what you like and don’t like when it comes to your style and clothing. You can send over Pinterest style boards and even make special requests (clothing/stylist etc). You pay a $20 styling fee (which gets credited back to anything you buy) and choose the date you want your fix to arrive. Once your fix arrives you have three days to try everything on and decide what you want to keep and what you want to return. They provide free shipping even for returns! If you chose to buy all your items you will also get a 25% discount which makes this service an amazing deal! If you only want an item or two, then you have to pay the full price. You also get to decide how often you want Stitch Fix to send you a box. I chose the option where I can request one whenever I want, but you can also chose to receive them at regular intervals, like monthly. After the success of my February 2017 Stitch Fix box, I’m considering ordering them more often! 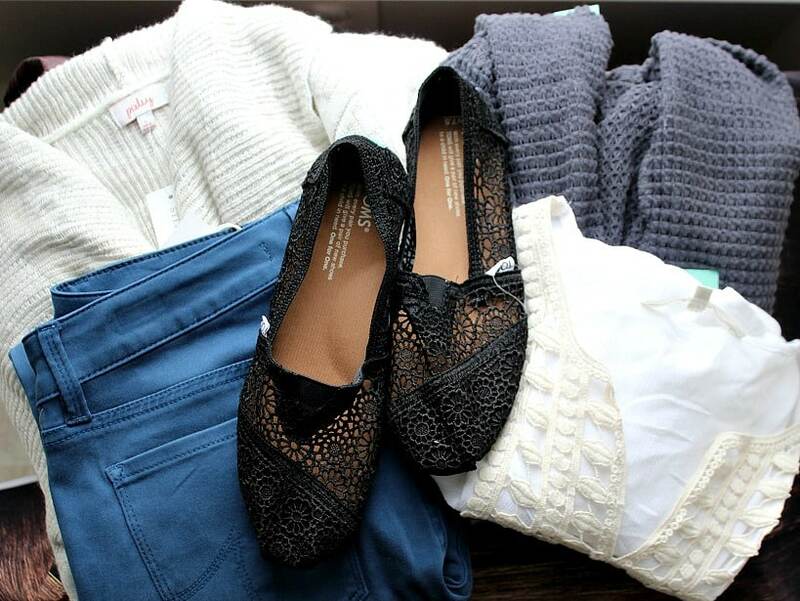 Interested in trying Stitch Fix for yourself? Head over to the Stitch Fix website to learn more!